We have two bedrooms. One for Mike and I, and the other for our boys, Theo and Oliver. We will eventually have to figure something else out once baby girl needs a room of her own, but for the first year we plan on her bunking with us. We’ve always had our kids in with us for the first year of life, partially out of necessity (we brought Theo home to our one bedroom, loft apartment), and partially out of preference. Having my babies close at night makes life so much easier when you are nursing. Plus, I just like the closeness factor. We’ve never owned a set of baby monitors – we haven’t needed them. When we moved into our house when Theo was a year old, he got his own bedroom. 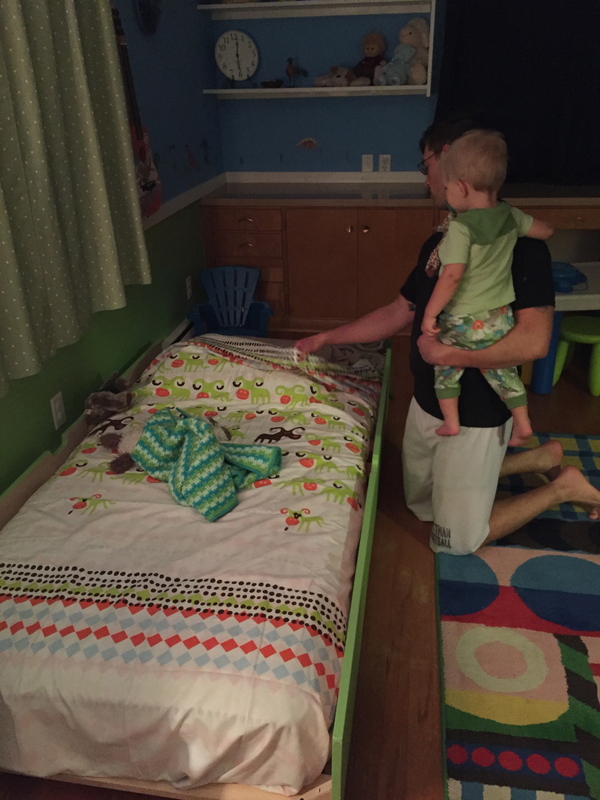 Then, when Oliver turned one, we moved him into Theo’s bedroom where he slept in a crib. However, now that baby girl is due to arrive soon, we thought we’d tackle the transition of getting Oliver into a twin bed. 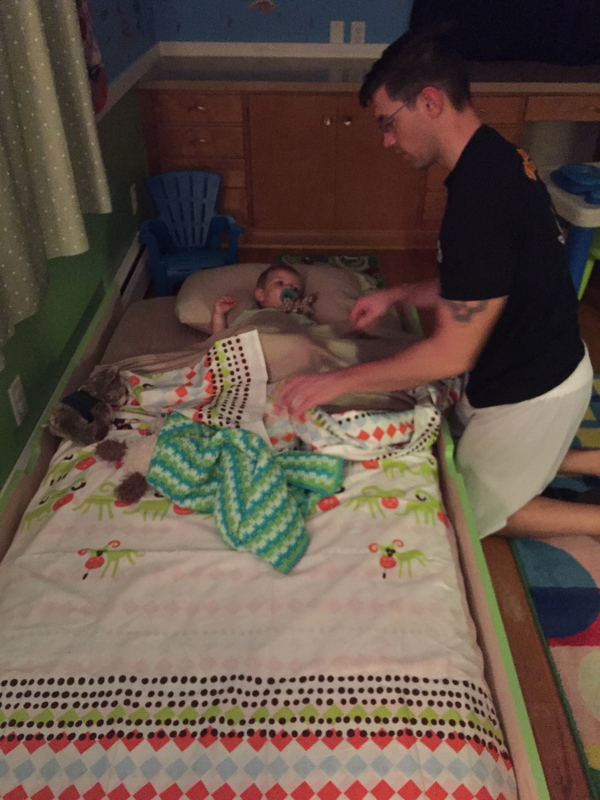 Mike built Theo a beautiful bed when he turned two and included a trundle. 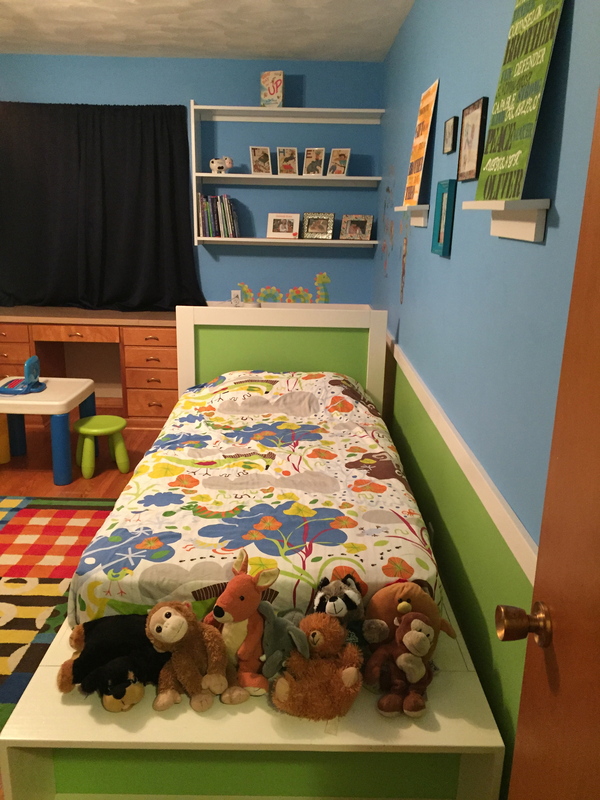 If you saw my Five Things post last week, you know I’ve been researching the Montessori approach to setting up a child’s bedroom. We decided to use Theo’s trundle as Oliver’s bed, so that his bed could be low to the ground and accessible on his own, true to the Montessori philosophy of giving kids freedom within safe boundaries. 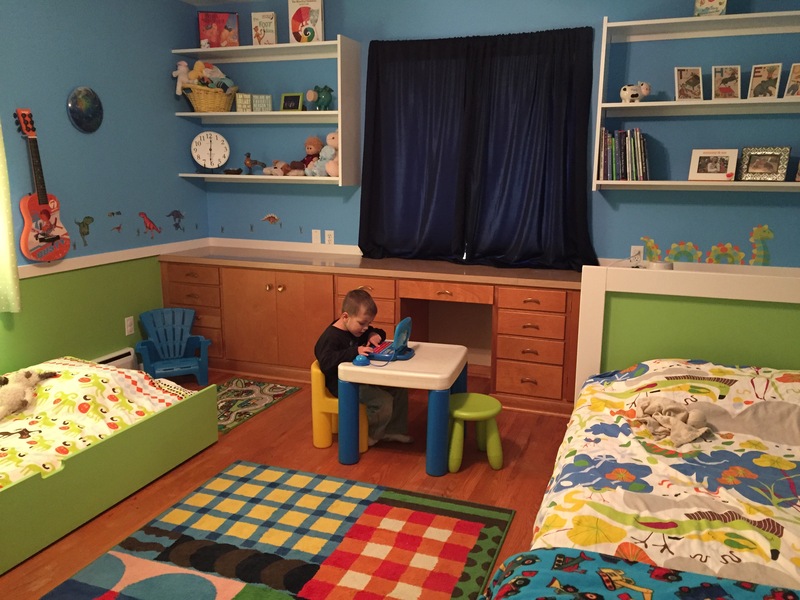 Mike and I set to work this past weekend getting the boys’ room set up with Oliver’s big boy bed. Together we took Oliver’s crib out of the room, cleaned boogers off of Theo’s bed, applesauce off of the walls (from where Theo brought Oliver “breakfast in bed” on several occasions), and swept and dusted the room from top to bottom. 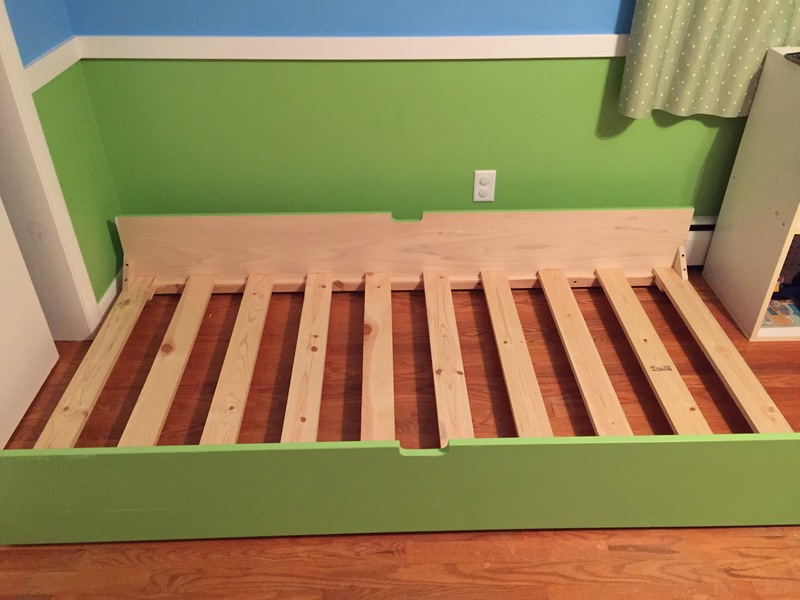 Here is Oliver’s mattress in the trundle, all made up and ready to go! His duvet is from Ikea. My dad made the white toy shelves. I found the vintage Winne the Pooh prints hanging above the shelves at a local antique store. The boys have few toys. They mostly have blocks, trucks, and lots and lots of books. Theo additionally has a guitar which he loves and a massive collection of art supplies which I keep under lock and key because…well, because he is Theo. If I wasn’t cleaning off boogers the other night, I was trying to remove layer upon layer of stickers and sticker goo from furniture. *sigh* He’s creative, but he’s destructive! Theo’s bed with allllll his buddies. His duvet is also from Ikea. Theo and Oliver’s own little art wall. I made the subway art that displays both their names and the words that we speak and pray over their lives. The three pieces in the middle are from local artisans. I’d love to continue to add to the art wall in the future. 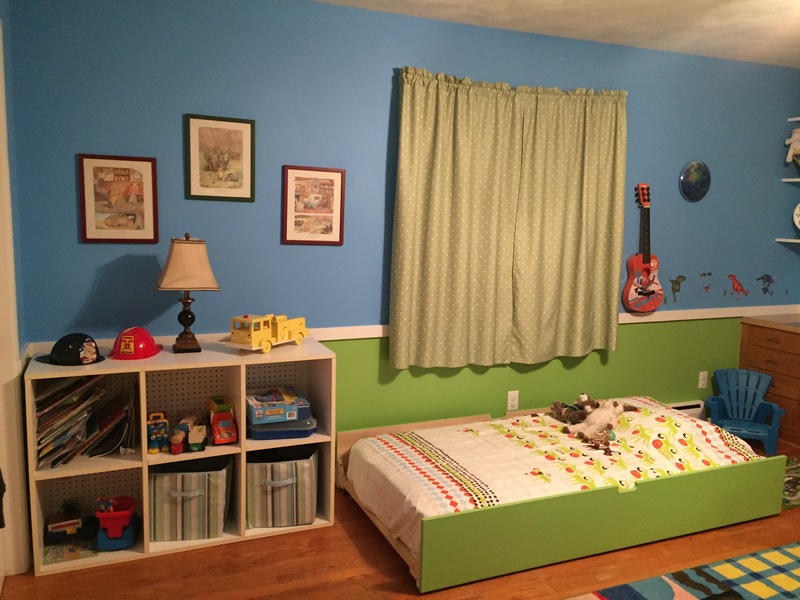 Our overall goal for the boys’ room in terms of decor is to keep things fun and child-like. But with that said, it’s important to me that things not be generic, because I don’t want my kids to be generic. We tried to make this space a place that is not only fun to be in, but also full of things that inspire imagination and creativity. Mike and I painted the walls shortly before Oliver was born. Mike added the chair rail and built the white shelves that you see on the walls. Isn’t he amazing? 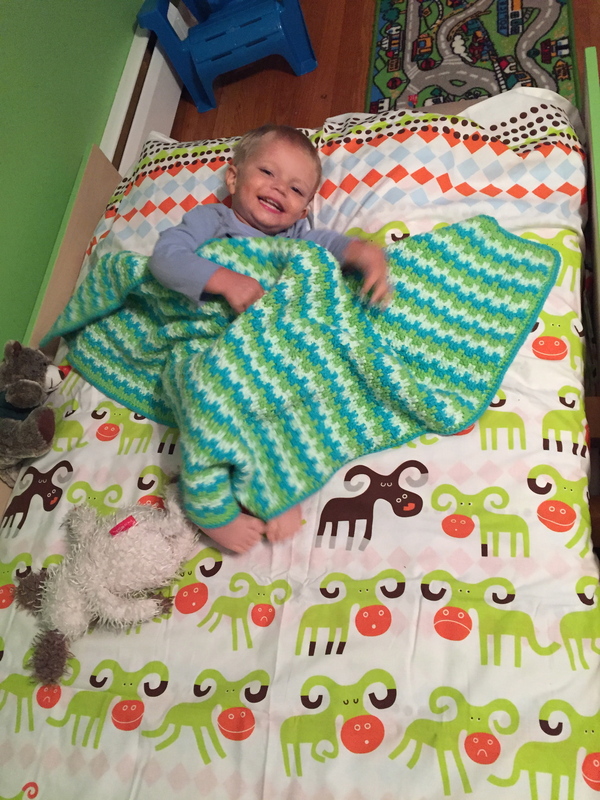 Here are a few photos from Oliver’s first night in his big boy bed. As you can see, he was pretty pleased with himself ;-). Although it requires a lot of thought and creativity on our part, I love that our home only has two bedrooms. I love that my boys will grow up sharing a bedroom, because I’ve already seen the fruits of such forced togetherness. They have to factor the other into whatever they do. Sometimes this leads to squabbles and frustration, but even that is a good thing because it forces them to work things out – together. I can’t wait to see how their bond grows through the years. As for baby girl, we know we have the next year to figure out a third bedroom. We have an idea in mind that we have been slowing working on and will continue to piece together over the next year. 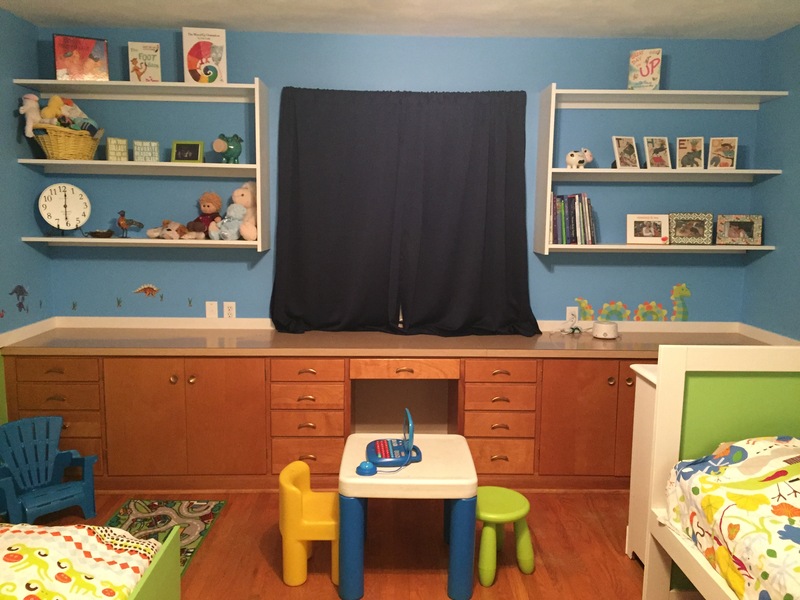 Ultimately, the boys will stay in their room and baby girl will eventually take our room while we create a bedroom space for Mike and I in our basement. I’m actually really looking forward to this transition. Although we will be seriously downsizing in terms of floorspace and closet space, we will be gaining a fireplace and a lot of privacy. It will be great! I hope you’ve enjoyed this sneak peek into how we’ve arranged the boys’ bedroom. It has been fun to put together! NOW WE ARE ALMOST READY FOR BABY GIRL RIGHT ? PEACE AND LOVE TO ALL ! 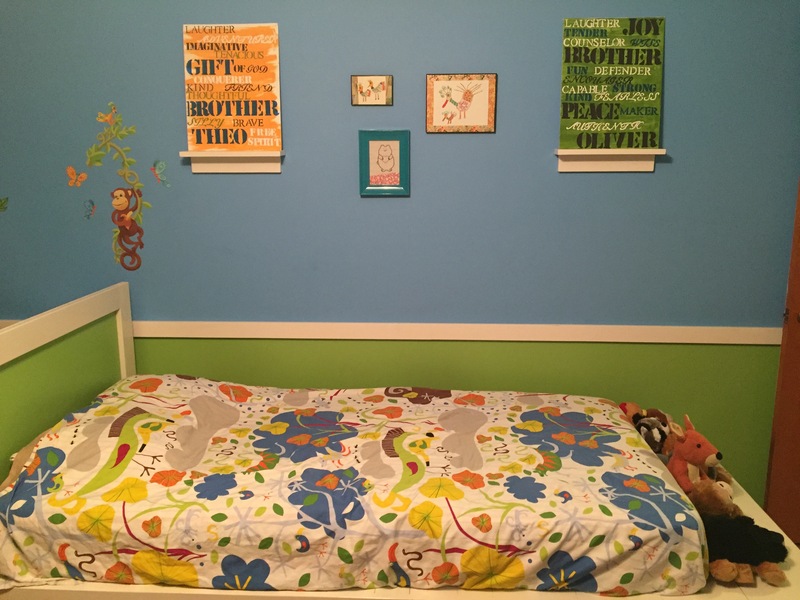 I love this post and the new one you put up about Beas “room” our girls share a room and I love it. also if you think about it you spend the majority sharing anyways once you get married and if you chose to go to college you also have a roommate so what better way to prepare them for a lifetime of sharing! Thanks Mandi! I completely agree with you. I heard that my generation struggled more than any other with having a college roommate because we grew up in homes where everyone had their own room and we didn’t have to share anything. I’m glad my kids are getting this experience from the beginning. Sometimes less really is more!